Three days ago 352 players took to the felt in the 2014 World Series of Poker Event #7 $1,500 Seven-Card Razz to compete for their share of a $475,200 prize pool. Today, the eyes of the poker world were on the tournament’s final table as Phil Hellmuth looked to capture yet another gold bracelet. The “Poker Brat” began the final table second in chips, and over the course of play he put on a clinic that showed why he was one of the best. Hellmuth outlasted several bracelet winners and eventually found himself heads-up against Ted Forrest, a five-time bracelet winner himself, one of which came in razz back in 1993. Forrest had taken a slow and steady approach at the final table, and while he was seemingly flying under the radar, he was also collecting chips. Both he and Hellmuth were looking to join the likes of Huck Seed, Gary “Bones” Berland, and Mike Hart as double razz bracelet winners, but only one of them would obtain the honor. On the 25th anniversary of his 1989 Main Event win, in a tournament that marked his 101st cash and 50th final table at the WSOP, Hellmuth seemed destined to win, but after an epic heads-up match it Forrest who finished as the last man standing. Hellmuth is denied No. 14. The first elimination of the day came quick when Greg Pappas called the bring-in bet with an showing and Hellmuth completed with a . Kevin Iacofano reraised with a , Pappas called, and Hellmuth pushed back. A series of raises saw Iacofano get his last 28,500 in the pot and he needed to survive against two opponents. Pappas and Hellmuth actually created a side pot when the former bet both fourth and fifth and received calls from the "Poker Brat." Hellmuth took the lead on sixth, promptly bet, and Pappas called. Hellmuth then bet seventh and Pappas raised him. Hellmuth called and discovered the bad news. Iacofano finished with a Q-8-6-4-A low, which was no good as Hellmuth and Pappas held a seven-five and six-four low respectively. Iacofano collected his things and exited in eighth place to a nice round of applause. It took awhile for the next elimination to occur but happened when Yuebin Guo got his tack in early and ended up making a Q-J-6-2-A low, which was no good against Brock Parker 10-8-4-3-2 low. Guo earned $14,517 for his seventh-place finish. Brandon Cantu, who had finished third in the 2012 WSOP $2,500 Razz, was the next to go after he failed to catch a river against Pappas, and then Parker took his leave in fifth place after being crippled by Hellmuth and finished off by Forrest. In Level 22 (12,000/24,000/3,000), Hellmuth completed with a and then called when David "Gunslinger" Bach raised with a . Hellmuth then check-called a bet on fourth street before leading out on fifth. Bach raised, Hellmuth reraised, and Bach called off his remaining chips. Bach was ahead with a nine low when the last of his chips went in, but Hellmuth managed to catch an 8-7-6-4-3 low on the river. Bach was drawing live, but when he squeezed out his cards he discovered another deuce to pair. Bach has to settle for fourth place and $34,979. He was no doubt hoping to do better, but notching a fourth-place finish after finishing runner-up in this event last year is an impressive feat indeed. After Pappas grew short, he played a hand against Hellmuth in which he wound up with a Q-10-8-6-2 low. 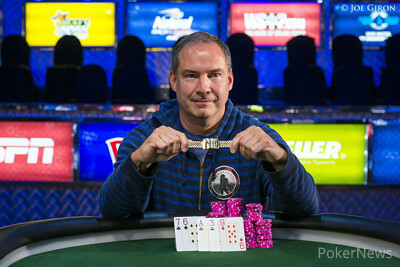 Unfortunately for him Hellmuth made a Q-7-6-5-4 low and Pappas was out in third place for $48,275. That left Hellmuth and Forrest to battle it out heads up with the former holding a 2-1 chip lead, but that didn’t matter much. The two consummate pros battled for hours, during which time Forrest clawed his way into the lead. 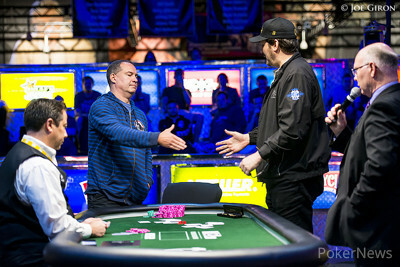 Hellmuth would take it back, and the duo would take turns trading it back and forth as the limits continued to increase. Eventually they became so big that every hand was swinging momentum. That is when Forrest caught the right run of cards to chip away at Hellmuth and finally finish him off. 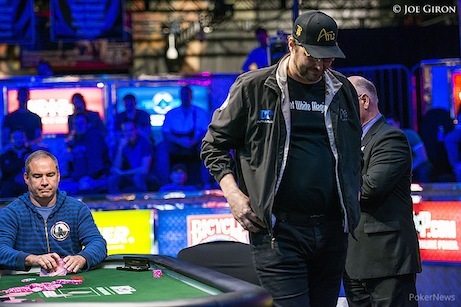 It's all over, Phil Hellmuth has been denied his fourteenth bracelet by Ted Forrest, who has captured his sixth gold bracelet and second in razz. In what would be the final hand, Hellmuth brought it in with a and then called off his last 35,000 when Forrest completed. Hellmuth's last hand saw him make a Q-10-7-3-2 low, while Forrest made a winning 9-7-6-3-A low. Things are looking bleak for Phil Hellmuth. In a recent hand, Ted Forrest brought it in with a and then raised when Hellmuth completed with a . Hellmuth called and then checked his on fourth. Forrest bet, Hellmuth raised, and Forrest called. Forrest then called a bet on fifth and then bet when Hellmuth checked sixth. Hellmuth called and then check-called a final bet on seventh. Forrest made a 6-5-3-2-A low and Hellmuth mucked, leaving himself just 45,000 behind. Phil Hellmuth brought it in with a and then raised when Ted Forrest completed with a . Forrest called and then bet on fourth when Hellmuth checked. Hellmuth called and then check-called a bet on fifth before betting sixth. Forrest called and then both players checked seventh. Forrest made a 9-6-5-2-A low, which bested the 10-8-6-5-3 low of Hellmuth. 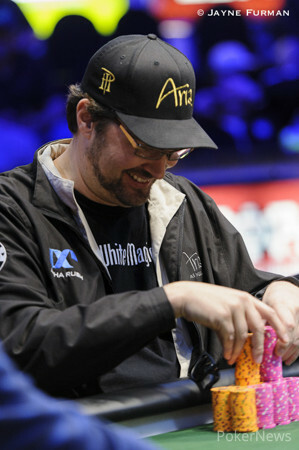 Phil Hellmuth is without a doubt the most decorated player in World Series of Poker history. With 13 gold bracelets, two WSOP Main Event titles (one in Europe), 101 cashes, and a membership in the Poker Hall of Fame, one cannot argue against his record. 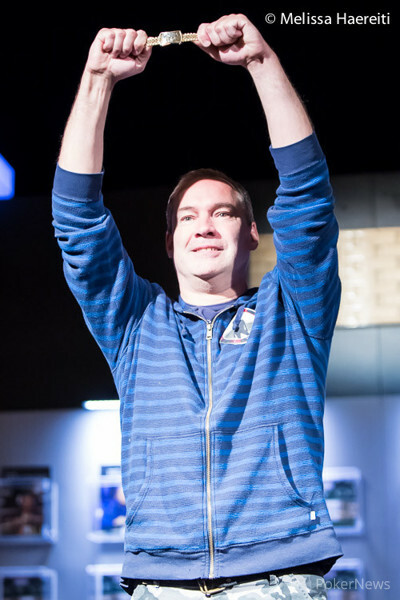 This year marks the 25th anniversary of Hellmuth's 1989 WSOP Main Event victory. It’s also the summer of his 50th birthday. In a recent feature interview, PokerNews' Rich Ryan sat down with the man often referred to as the "Poker Brat" to discuss his win in 1989, the past 25 years of poker and his life, and much more. Click here to read the full interview with the man himself, the one and only Phil Hellmuth. Level 26 is in the books, and that means it is time for another 20-minute break. We'll have updated counts in a bit. Phil Hellmuth brought it in with a and then called when Ted Forrest completed with a . Hellmuth then called a bet on fourth before folding to one on fifth. Will Hellmuth Capture Bracelet No. 14 & His Second Razz Title in Three Years?